Picking a color can be frustrating. Where do you start? How do you judge one option better than another, when color is so subjective and can mean different things to different people? It can feel like there is either an infinite number of right solutions, or none at all that would work for your specific situation. I always feel like that when I begin my color selection. But the more I examine my constraints, goals and use cases, the more clear the answer becomes. In this case, I was picking a brand color for this very project, Design Art Practice, and I found one that makes sense on many levels: IK Blue. By digging through art history, as well as modern cultural references, I was able to satisfy my own curiosity as well as make a design decision that will make sense on a cultural, as well as aesthetic level. 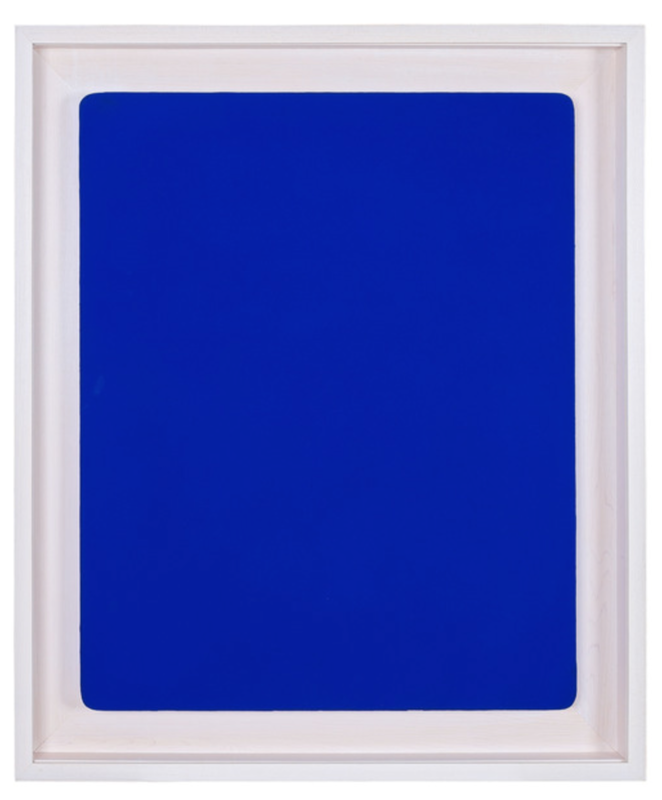 Ultramarine acrylic paint gives a very close approximation of what International Klein Blue looks like. I knew starting out that my brand color would have to be distinctive when used by itself, but also be able to work in cooperation with all the colorful artwork I write about. At the same time, I wanted the color to feel modern and fresh - yet not tied to a specific recent trend. The use case for the brand color would be as an accent alongside large sections of neutrals - white, gray, muted black, and warm bone or beige. The website would be mostly white to recall the feeling of a “white cube” gallery. These qualities together present a difficult, almost conflicting set of goals for a single color to take on. I even got a chance to present conference talks on color for UX design as a way to continue researching and feeding this obsession. Among all the pigments with their complicated meaning and history, blue stood out to me as a good match for the conflicting goals I had set. And unlike red, green, or yellow, blue does not have a “reserved” cultural or interface meaning (think the colors of a street light). It does, however, come with a deep set of historical associations. The color International Klein Blue was the first pigment patented for its specific color properties. The artist, reportedly in opposition to his work being liked for the aesthetic properties of its colors alone, rather than the deep meaning, has restricted all his work to a single color. Klein’s blue was not an accidental choice either. The vibrant shade of blue carries the meaning from a historic pre-chemical precedent: ultramarine blue. This pure pigment was brought in from remote locations, and was more precious than gold. The precise amount of pigment to be used in a painting was so important that it was contractually agreed between a commissioner and an artist - for example, Johannes Vermeer. Earlier, in medieval illuminated manuscripts, the precious blue pigment was a reserved color to depict saints like the Virgin Mary. The pure red and blue paint was never mixed then, but used alone to show off its purity and saturation. But even in modern times, IK blue has reappeared in use. IK Blue is a trend in art publications as well as in online use. The precise hue is difficult to represent on-screen correctly, but the feeling of intensity you get looking at IK blue in person is similar to how #0000FF Blue color feels. Incidentally, this was the color chosen for hyperlinks on the early see - this standard is now largely outdated, but the blue underlined links remain a classic reference point on the web. For all these historical and cultural reasons, I find IK blue to be a great choice as an accent color. Perhaps, I did not need to read about paintings in the Dutch northern renaissance to justify my color choices - but having that background gives me a story to tell. It also grounds my choices in the history of things that worked out well for others. My hope is that this way of thinking will make my work last longer and survive trends without looking outdated. Here's a sneak peek at the direction of Design Art Practice.